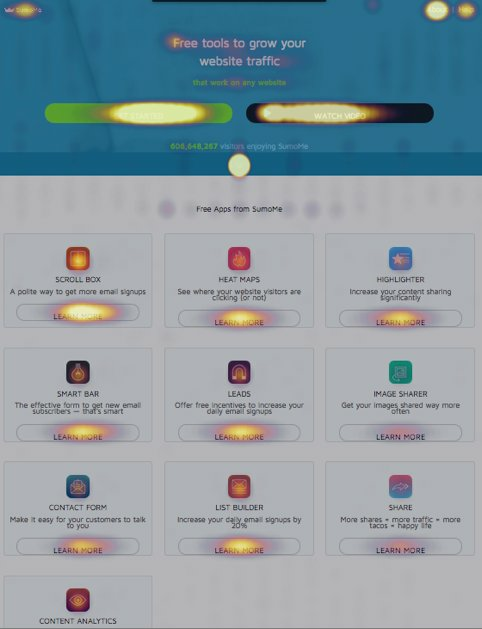 Heatmaps - The Hot Diagnostic Tool for B2B Marketers! From generating quality leads to driving more traffic to your website, the efforts invested in B2B marketing are nearly twice as more as compared to any other industry, especially B2C. Each lead is a potential customer, which means everything done in the process demands utmost precision – taking the right steps to highlight your brand’s USPs, personalizing customer experience, optimizing sales funnel, offering a fluid and easy-to-navigate website, and so forth. Also, low traffic and low search volume are a constant fight for most B2B companies. It makes it difficult for them to gather accurate information and derive definitive conclusions about conversion rates and the performance of their website. So, how to ensure that the efforts you’re putting in to make your B2B marketing campaign success will definitely show results? This is where tools like heatmaps come into play. Heatmap is a smart analytical tool that makes use of color-codes to highlight webpage areas where customer-attention is concentrating the most. The hotter the area, the more traction it is getting, and vice versa. Typically, shades of red depict the highest customer-attention-grabbing areas, while shades and blue and green represent the opposite. Let’s move forward and see how heatmap optimization can help you maximize your B2B marketing efforts and achieve business ROI. Heatmap optimization serves as a handy and powerful tool for B2B marketers. It provides useful data (in the form of graphically represented color codes) about page areas that are performing well or need improvement, and form hypothesis to optimize them to increase conversions and retain customers. 1. Heatmaps offer an Instant Overview of Essential Web Performance Parameters. Unlike other analytic tools, heatmap allows B2B marketers to study essential web performance parameters. They highlight the areas of problems or opportunities and enable marketers to make informed decisions. 2. Heatmaps help Understand Numeric Values in the Form of Visuals. Hard statistical numbers entered in a spreadsheet may tell you that a particular page has low user engagement, or that a given page element is not yielding the results as expected. Here, heatmaps quickly reveal the pain points or distractions that a visitor encounters, detail upon the exact reasons, and enable B2B marketers to take necessary actions before their conversion rate falls. In the case of web design, gathering important learnings can help B2B marketers understand their site and audience behavior in a better manner. While surveys and forms have their own role to play, they are certainly prone to some form of bias – what they reflect may not necessarily be the exact thing users do on your website. Here, heatmaps come in handy. They serve as a better and more powerful tool to analyze the navigational patterns of users on your site which helps gather data that’s accurate and untampered in nature. 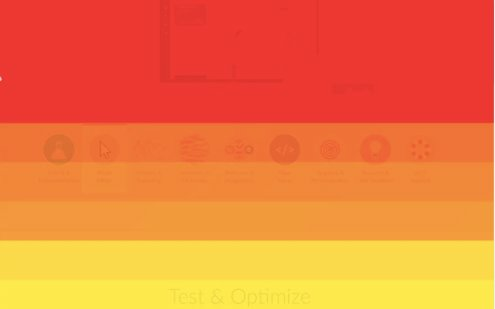 Combine heatmaps with A/B testing, and your learnings become predictive without being obstructive. The “About” page link got maximum clicks. Visitors clicked on “Get Started” and “Watch Video” the most. Visitors clicked on the down arrow even though it did not work. While the individual tools got a lot of clicks, the ones highlighted on the right side of the page got fewer clicks. Sumo used these insights to make necessary amendments which eventually helped them to get more conversions. Every call-to-action button placed on your website has its own conversion goal. It is important to assure that it’s receiving the desired attention as you’ve planned. Here, heatmaps help in checking the effectiveness of your CTAs – whether or not your visitors are clicking on them and taking the desired action. 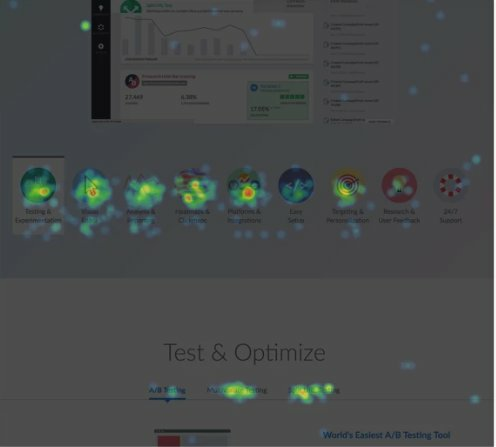 Combine heatmaps with A/B testing to better understand your user’s insights and maximize performance by implementing the changes noted in the process. 5. Heatmaps help Reduce Form Rejections. Forms play an essential role, especially when it comes to B2B businesses. They help in gathering essential information about customers visiting your site. Such information is crucial from the sales point of view. Optimizing them can significantly help in improving conversions. While many theories follow on how to use a form, or what must be its content, the ideal way to test which type of form would yield the best results, make use of heatmaps. Let’s take an example of a SaaS company. Analyzing that most people were not filling their form placed on their checkout page. Using form analysis, they found out that the hesitation time on the “Referral Code” field was high. Basis this finding, they formulated a hypothesis that people were not able to find the Codes to avail discounts which were pushing them to abandon their purchase. As a final check to solidify their hypothesis, the CRO team at the company decided to check the heatmap for the checkout page. They discovered that it was the navigation bar at the top which was the source of distraction for the users. They were clicking on the ‘Plans and Pricing’ tab here. This completely changed their first hypothesis. In a nutshell, heatmaps offer an additional lens to find out qualitative insights to help you discover problematic areas and make necessary amendments to enhance conversions. Inbound marketing and content marketing are two powerful tools for any B2B business. Hence, having well-crafted content that’s sufficiently infused with valuable information on your website is highly essential, especially from traffic and conversion standpoint. Scrollmaps, another form of heatmaps, offer useful data on the performance of these two key elements. They provide strong, reliable information about how visitors are moving through your content – how far they’re scrolling through the page, the parts where they are getting distracted, the links they’re clicking, and so on. Such information can help you analyze where to place your CTA and important links to increase lead generation. Heatmaps are one of the most effective analytical tools to help B2B marketers better understand customer behavior, analyze essential data, derive valuable qualitative insights for website optimization and form better hypotheses to increase conversions.